On this course you will make a necklace, bracelet or earrings from your own repeating, relating or random links. Expanding beyond the limits of commercially available chains, we investigate ways to create interesting links to make your own, unique chain. Belcher, Snake, Trace, Box, Rope, Curb… so many chain types are commercially available but the possibilities for linking are endless. On this weekend workshop you will be inventing & making your own fancy chain to wear as a necklace, bracelet or earrings either to compliment an existing pendant or to stand alone. You will learn a range of techniques for connecting metal. Joining methods include soldering and riveting. 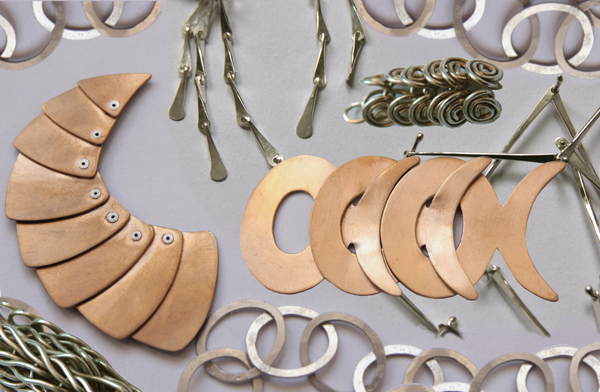 We also look at ways to create different shapes: forging, forming, piercing, wire manipulation. You will learn how to make & incorporate a simple clasp. The course fee covers the cost of non-precious materials – Copper & brass are provided – & we have silver available to purchase. *If you are a UK residents and on a low wage, or in receipt of tax credits or other benefit you qualify for the Flux concessionary rate. This is a discretionary discount which we personally subsidise. Please consider how much you need this discount before choosing this option.